New Meaning to "Single-Handed" Halo Skills | Juxta Services, Inc. It has been forever since I have posted. This is due to a combination of “fear factors” including but not limited to: the fear of over-caffeination (side-affect of too much Dr. Pepper to offset my lack of sleep); the fear of spousal condemnation for spending more time thinking about work than my family while at home; the fear of a DNA sucking evolutionary monster coming to cut the top of my head off with his mind before forever stealing my mutant power to spend more money than I have, while my time warping friend is powerless to stop it; and last but not least my fear of the higher education gods booting me from their presence forever after taking my future economic well-being and leaving me standing in the gutter dripping with the disappoinment of the splattering from a fresh pile of half-finished research. If you have no idea about anything I just said, trying to explain further will do little good, so I won’t. Suffice it to say that I’ve found my marbles with most of those phobias so I’m back. In the spirit of togetherness, today’s post deals with the wonderful feeling of camaraderie that comes from a fellowhip of souls coming together to blast the crap out of each other’s virtual alter egos in what the old fogies call “Hello Too”. In this XBOX thriller, man and fanatical religious alien alike meet to take turns head bashing and high balling in attempt to win bragging rights and a few seconds of glory. Sadly however, this euphoric togetherness cannot be shared by all. There are those left out of the mix. Until now that is. 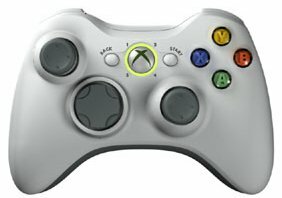 In a tribute to my good friend the “One-Armed Bandit” (I told you I’d blog about something you’d like in reward for your faithful and possibly singular following of my posts), I’d like to share with you this ergonomically brilliant hack of an XBOX 360 controller to make it…yes folks…1 handed! Finally freedom for all! A regular doer-of-good over on one of my favorite sites hackaday.com, Ben Heck has created a 360 gamepad mod that allows the gamer to use one hand and one leg to perform the very same virtual functions that it takes most men (and women) two hands to do! Tell me that ‘aint worth a Nobel Prize. At least a Newberry Award! Anyways, it is a pretty brilliant hack, assuming that the setup is really playable. I don’t want to steal any of Ben’s thunder, mearly suppliment it with my own “hurrah”, so check out the details of the full hack over at his site. Until next time, keep the D&D dice rollin’!